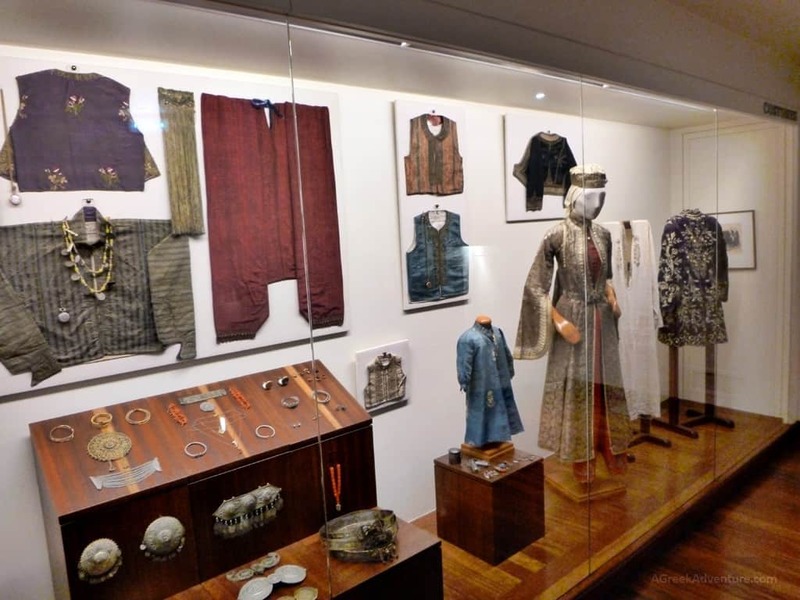 If you really want to travel and explore cultures and life, you must visit the museums of the places you go. That is why we went to the Jewish Museum in Athens. We believe that people have more in common than differences. Having visited Dachau a year ago, visiting this museum was something natural to do, as Dachau remains quite an emotional place. 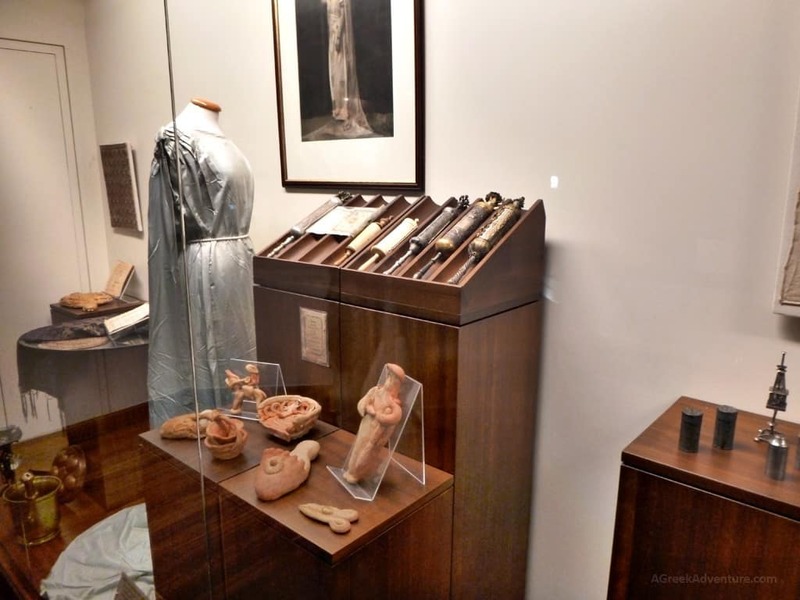 A thorough tour inside the Jewish Museum of Athens, with a knowledgable guide, is primarily a mind opening experience. 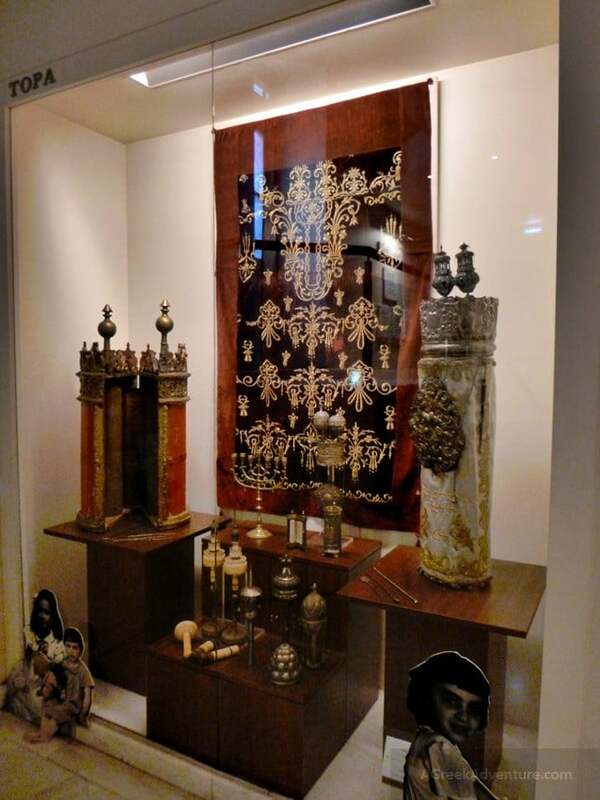 As the museum is mostly about the history of Greek Jews, we found out that that history goes way back in time. Our guide was Eleni from Urban Athens Collective. She loves Athens and its history. 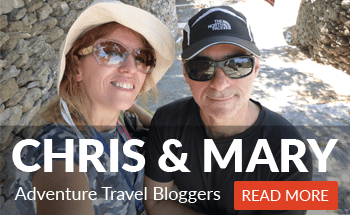 That, along with her passion to communicate the different cultural aspects of this city (and her studies in European history), were extremely helpful, so we learned a ton of things. 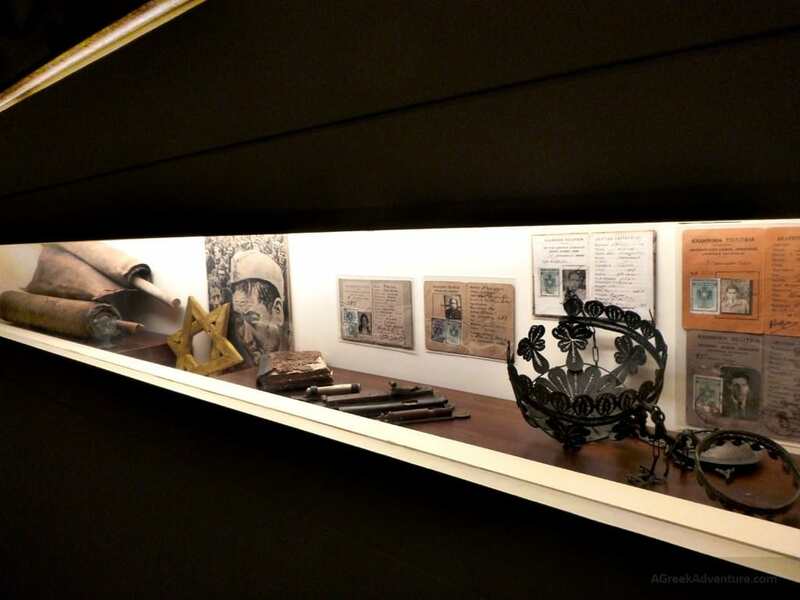 Inside the 3 floors of the Jewish Museum of Athens, you will see significant facts and relics of Jewish history in Greece, along with its course during the ages. The Jewish population of Greece was analogically small but strong. That community suffered a lot (as many others) during the 2nd World War, but also thrived in many levels. Below see the fake id cards issued by the Greek government so Jews could show Christian names and avoid captivity by Germans. 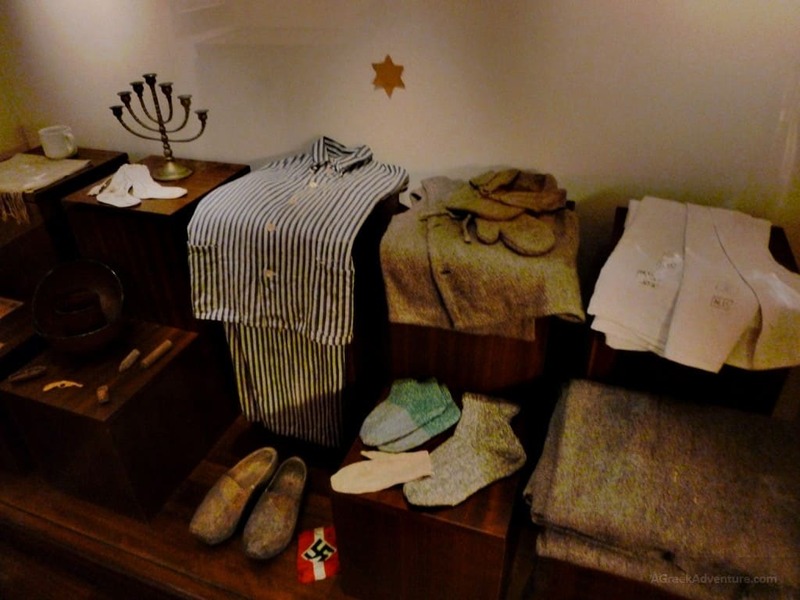 Clothes from a concentration camp, offered to the museum by a Greek Jew survivor. 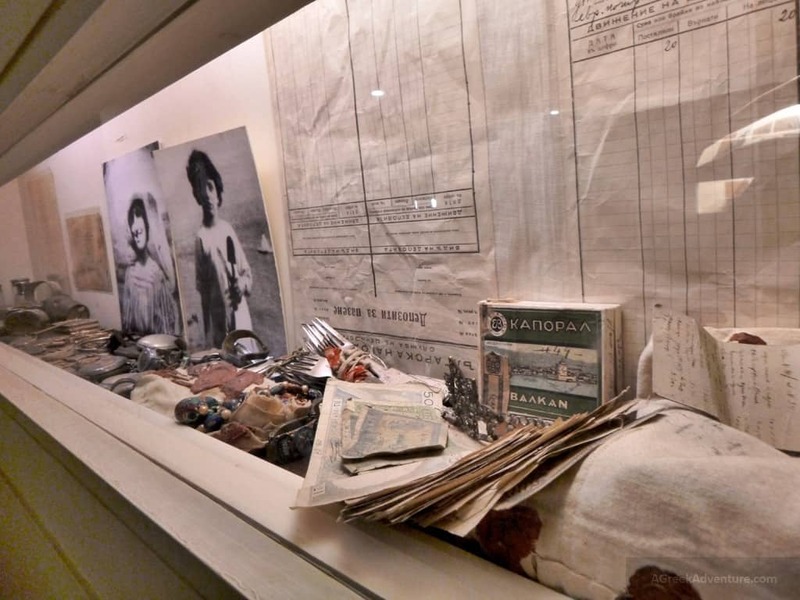 A variety of items returned to Greek Jews community after the war. But the reference in World War 2 is just a part of the whole history. The first things we noticed were a number of similarities and influence of Jew culture into the Greek culture and vice versa. 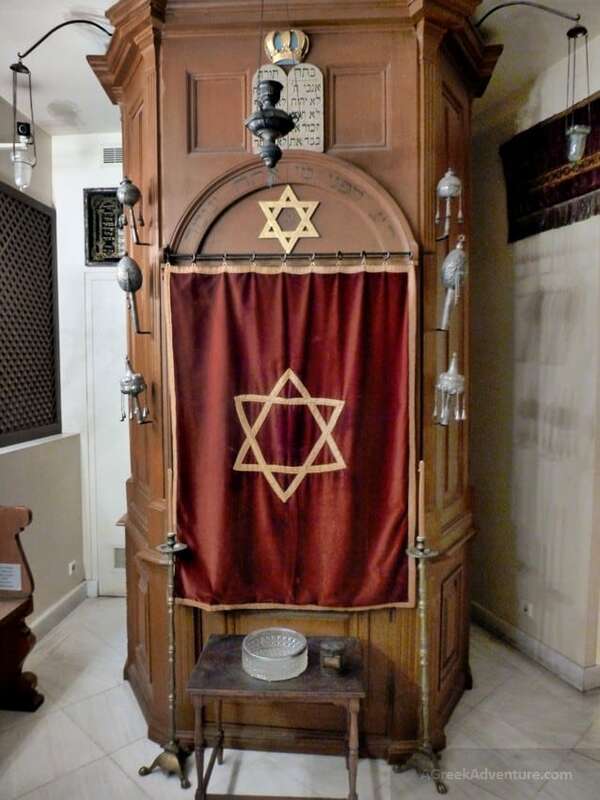 As Jew communities were spread all over Greece, they were influenced a lot by local factors. Similarities can be seen in clothing, jewels and everyday objects. The museum is better to be walked from bottom up. There is a reason for that as you will experience how Greek Jew history and culture evolved during the ages. Plus, you will see that despite the World War Holocaust, their history didn’t stop but continued. 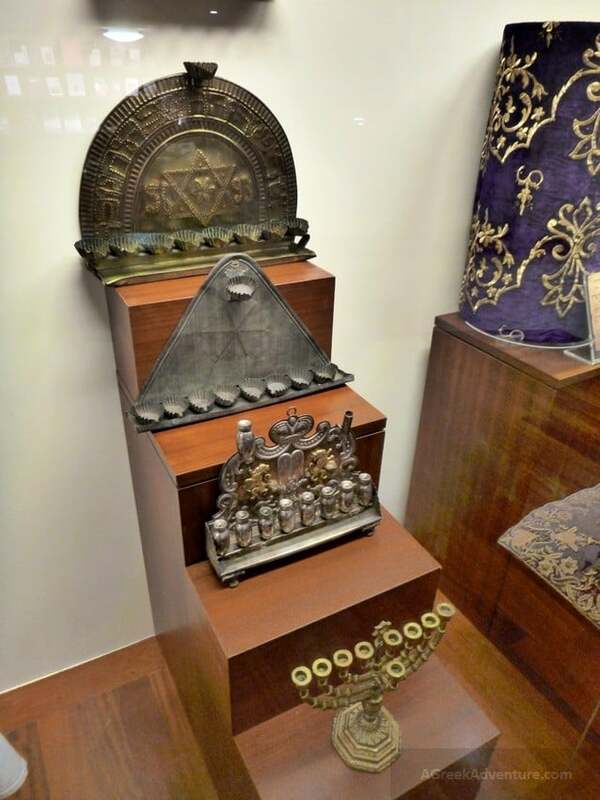 There is a real Synagogue setting (the one of Patras) in one of the floors, with all the ritual objects that are used. 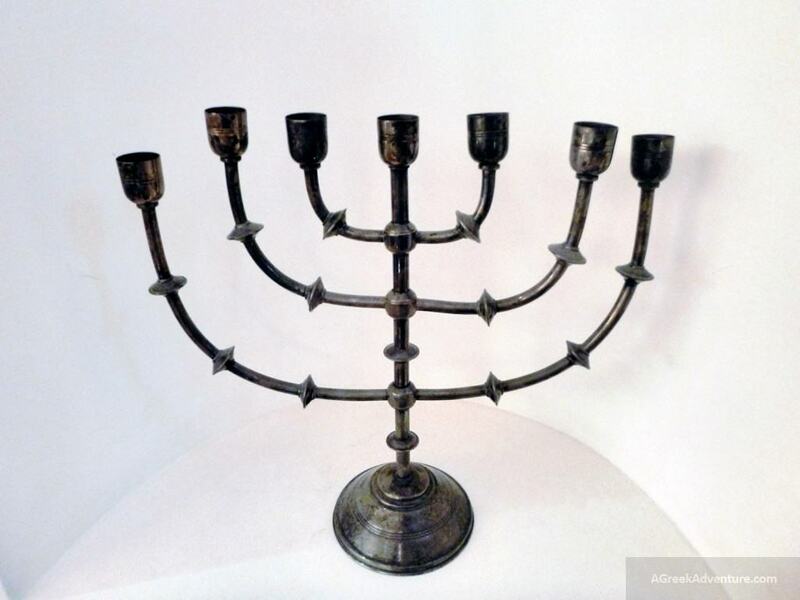 This here is one of the 2 pieces the consist the Synagogue setting. Behind the veil, the scriptures are kept away from public. Below: Different Tora cases (Sephardic and Romaniote). 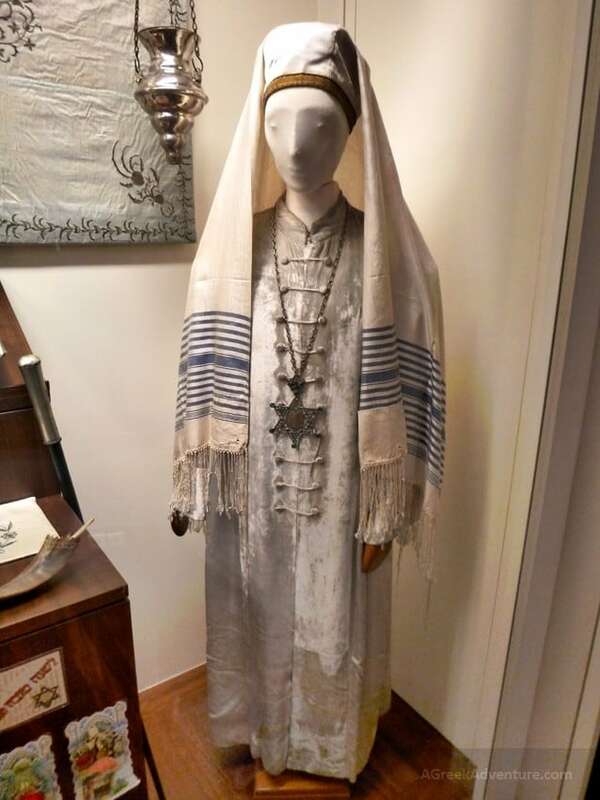 The cloth in the middle comes from wedding garments. 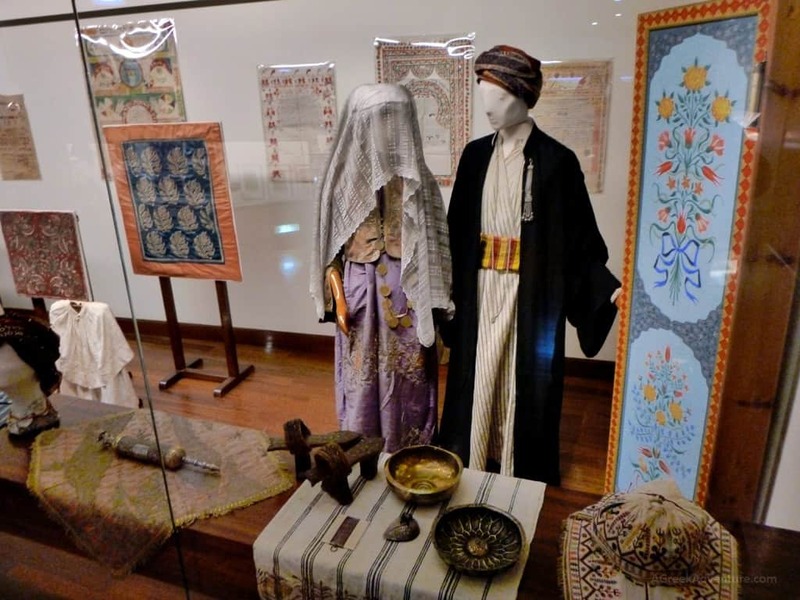 People used to modify their wedding garments and offered them to be used as veils. 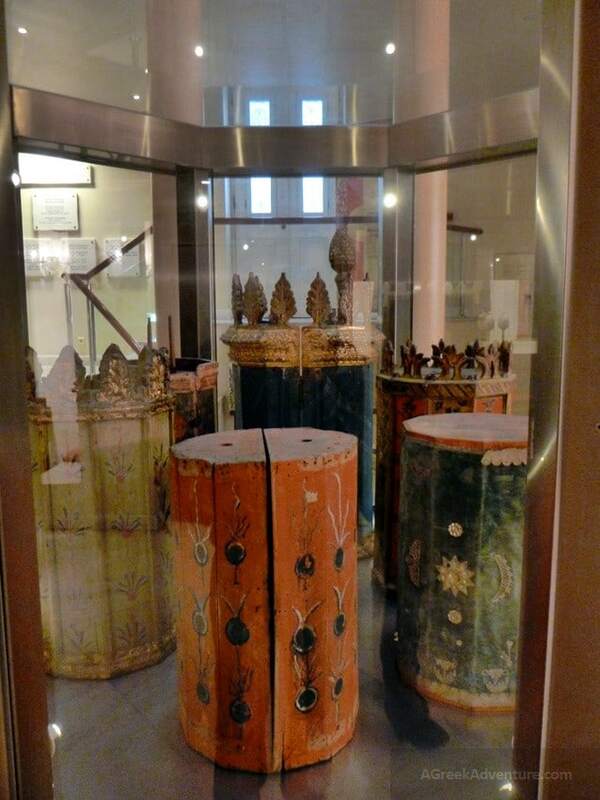 Protected behind glass and in controlled temperature are Tik cases. They were used to keep in the Sepher Tora. 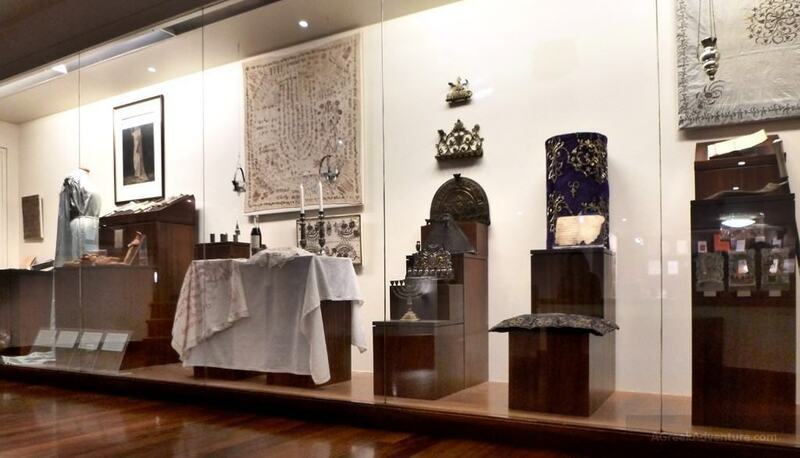 In different floors you will also see elements from the daily life, used in religious anniversaries and different festivities. Below: Different types of oil lamps. All have 8 plus 1 containers. Here are sweets (look like made of clay but are not) that were prepared for special holidays. 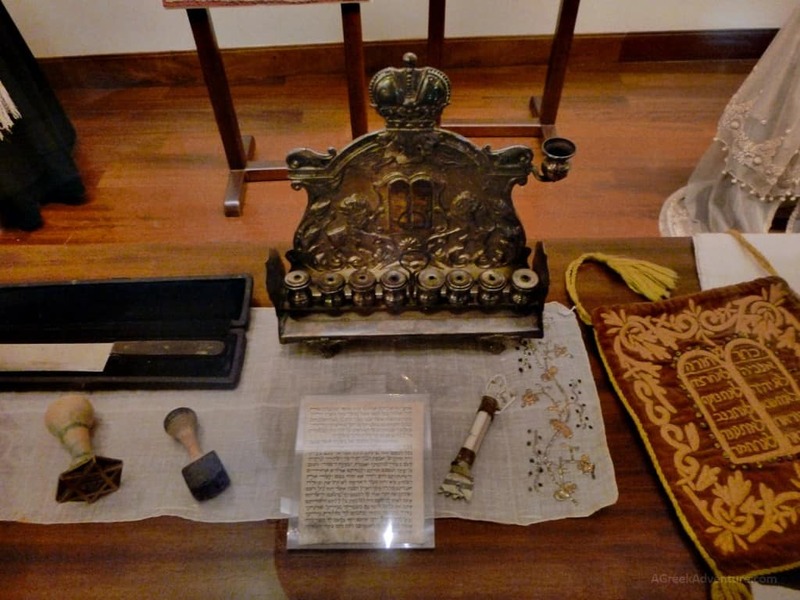 The visitor will also see tools and artifacts used in circumcision and in other rituals. We really think this is a must to visit. It will bring down many stereotypes which you may have picked up around. 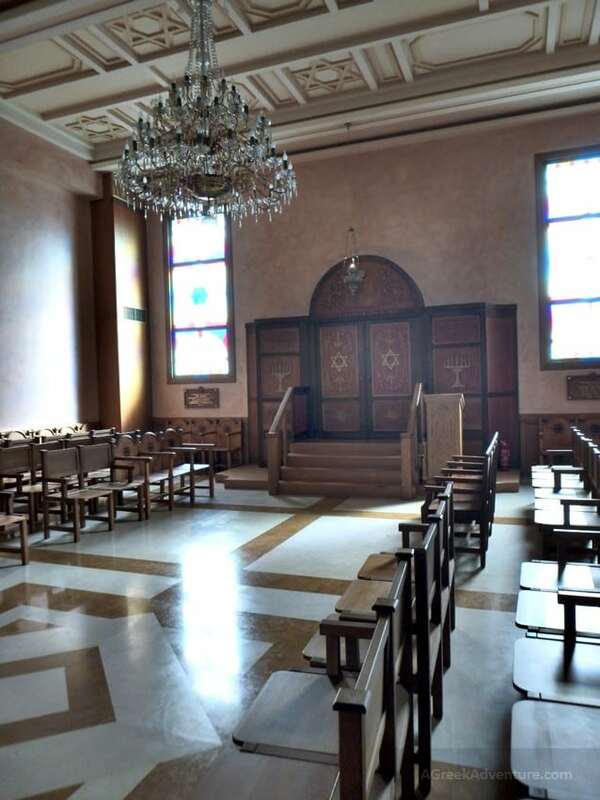 The 2 Synagogues are located in a different (10-15 mins walking distance) location and one is opposite to the other. You need to get through a security check, around 1 day prior being allowed to visit the Synagogues. The reason that are 2 so close to each other has to do with a variation in the culture of Jews. 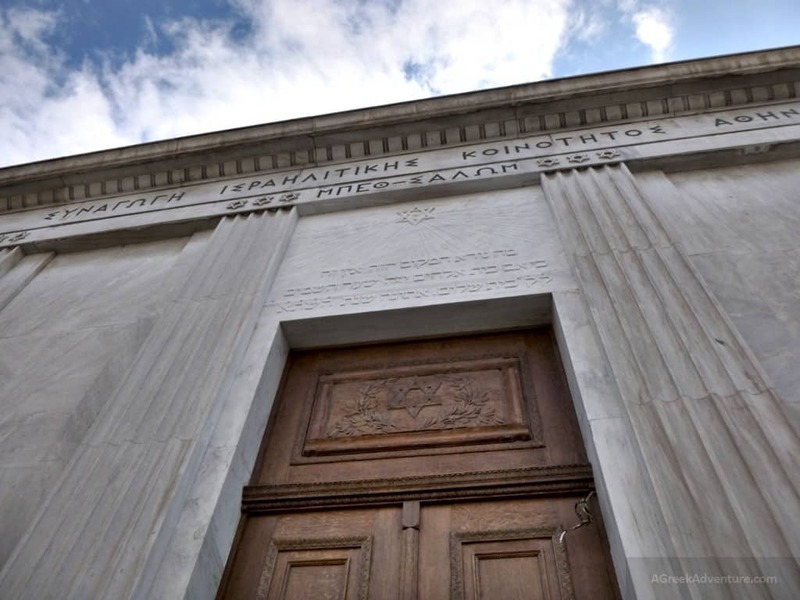 So there is the Sephardic Synagogue of Athens (Beth Shalom Synangogue) and the Romaniote one (Etz Hayyim). This one is the Beth Salom. 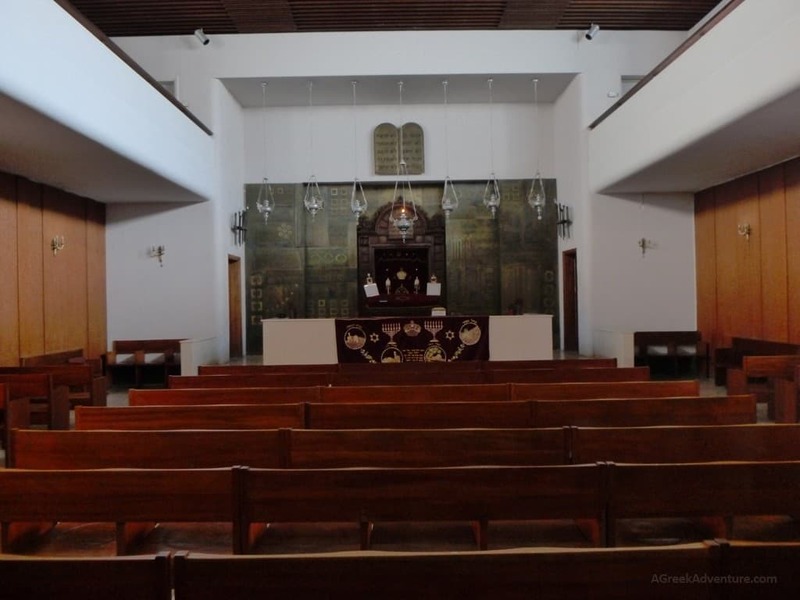 Below: The exterior and interior of Etz Hayyim. Both are places of worship, so the visitor must act accordingly and respect the culture. The decoration is simple, yet visually imposing. 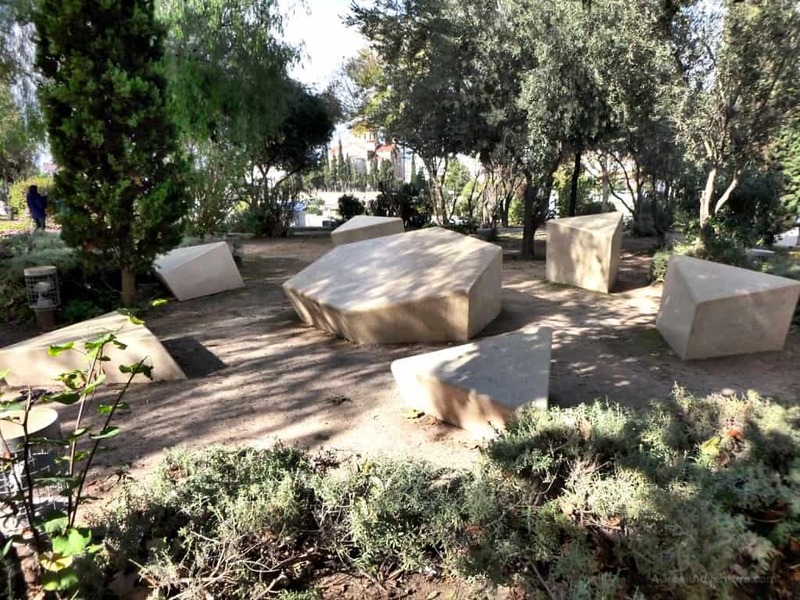 A few meters outside of the Synagogues there is a small park that oversees Kerameikos area, where a monument that resembles the Star of David is situated. This is a memorial for the Holocaust, where 88% of the Greek Jews were exterminated during WWII. 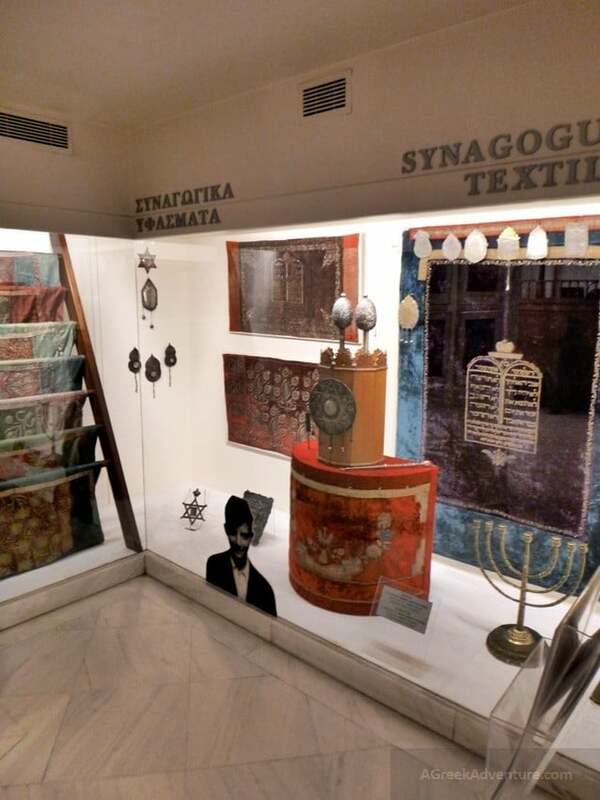 The Jewish Museum in Athens is located at Nikis 39, Athens 105 57, Tel. : +30 210 32 25 582. 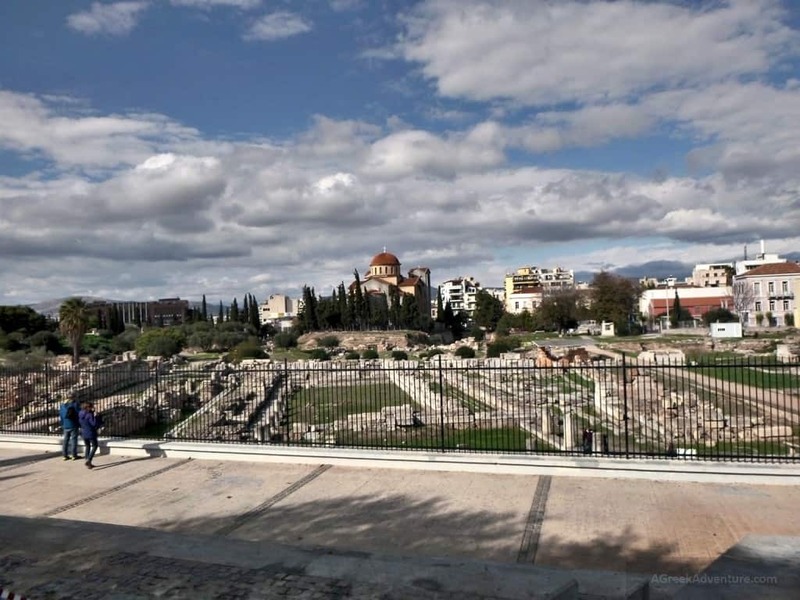 It is in a 5 minutes walking distance from the Metro station of Syntagma. It is best to visit it with a guide, otherwise you won’t learn much. 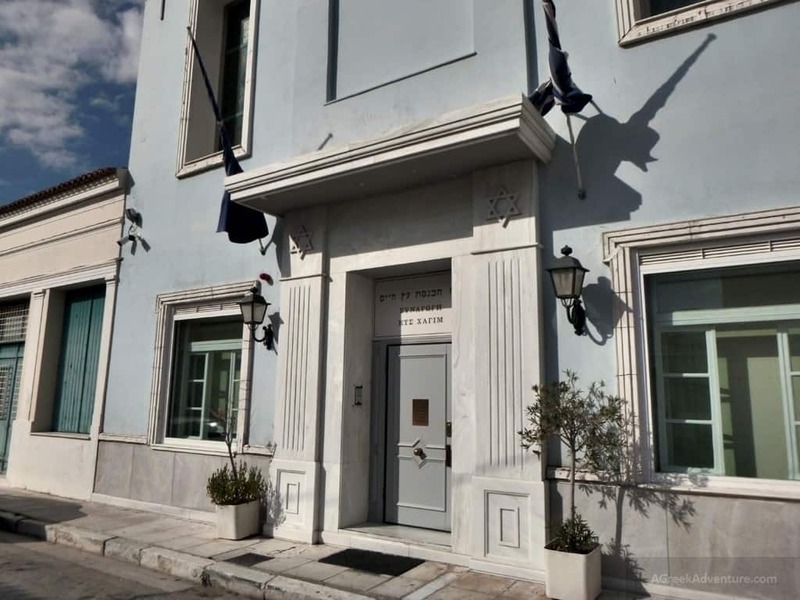 Both Synagogues are located at 8 and 5 of Melidoni Street, Athens 105 53, near Thiseio. Thiseio is a popular area, very close to Metro, where you can additionally visit, find and eat different things. You need to pass a security check 1 day prior visiting the Synangogues. A guide will arrange for that. Have a great time. Ιf you want to book with the tour Urban Athens Collective you can do it via Visit.org in this link.